So, will you assemble the second printer and have them both produce RepRap parts? Will I have them both going? Yes, and that'll be a fun challenge from a software perspective! Forrest, I hate to think how long it took. I'm so jazzed I gotta go work off my adrenalin in the greenhouse. Everybody have a repraperific day! "Forrest, I hate to think how long it took." ROTFLMAO! Is that the number you want me to quote? Of course, now it's just a matter of geometric progression. 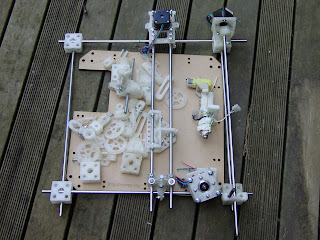 Two RepRaps can produce a third in half the time the first one took - three will make the fourth in a third of the time. Pretty soon either the entire mass of the solar system will be made up of RepRap machines...or Vik's going to run out of threaded rod. Let's just hope it's the latter! Congrats on a well-deserved slashdotting! Would you please create a forum for my balmy home region of Columbia and Venezuela? Forrest Higgs, Michael Hart, Brett Bellmore, Jonathan Marsden, and Zach Smith are all from Columbia. However, I don't know of any from Colombia. The first practical replicated machine - book the display case in the Te Papa Museum.